The pedals of flowers in nature are rich in colors, red, orange, yellow, green, blue and purple, every color we could think of; but, we seldom see plants with black flower pedals, and tacca is one of the plants that have black flower pedals. Tacca is a vivaium herb; it has beautiful flowers and leaves, we could enjoy its leaves, and we could also appreciate its flowers at the same time. Its leaves grow in bundles, and are somewhat like the leaves of the dasheens; more, they are exuberant all the year round. 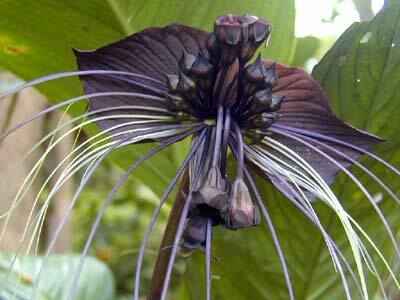 The blossom period of tacca is 4 to 8 months, and the flowers are brown or black, which are seldom seen in all plants; besides, its flowers are quite peculiar in shapes, there are dozens of purple veins in the base of the pedals, which resemble the musts of tigers, thus, it gets its Chinese name, "tiger�s musts". In the "99 Kunming World Horticulture Fair", it was a critical displaying flower in the big greenhouse; it caused great sensations in all over China and attracted a huge amount of Chinese and foreign visitors; it also won a gold medal in the fair. Tacca scatters in Canton, Guangxi and Yunnan in China; and it also grows in India and Indo-China. It usually grows beside waters and under the shade of forests. Its roots could be used as medicines, which could cure illnesses such as high blood pressure, hepatitis, and gastric ulcer etc. But, it is poisonous, and must be care at use.